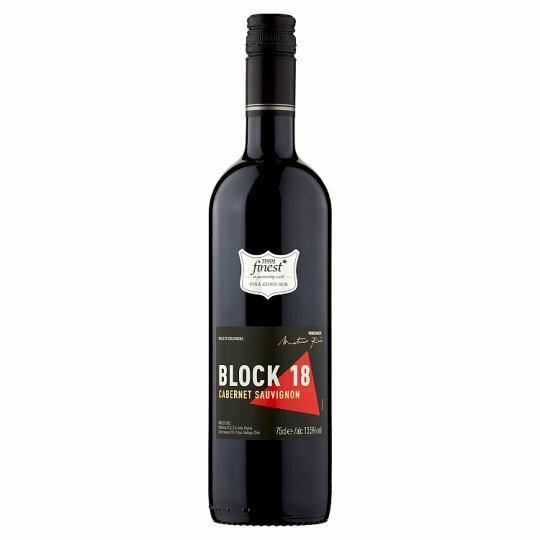 Front label: 2017 BLOCK 18 Cabernet Sauvignon Wine of Chile . Valle Del Maipo Back label: Made from premium Cabernet Sauvignon grapes from Chile's renowned Maipo Valley, this red is deep in colour and brimming with blackcurrant and plum flavours. Aged in French and American oak barrels for 12 months, which helps add roundness and complexity, the result is full bodied with a long, rich and smooth finish. Fantastic with grilled, roasted or barbecued meats. Stored in a cool, dark place this red will develop nicely for up to 5 years. Grapes are hand-picked and delivered to the winery where they are gently de-stemmed and crushed and sent to fermentation vessels where yeast is added and the wine ferments at 28 degrees for 7 days. This is followed by a malolactic fermentation and then aged in French and American oak barrels for 12 months. The final blend is assembled and the wine is then filtered and made ready for bottling.